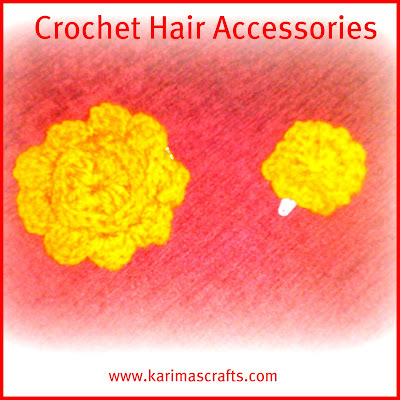 Above is a photograph of one of the crochet flowers that I made recently. 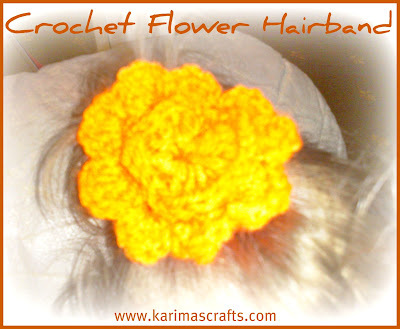 I needed some orange hair accessories to match my daughters orange dress I made for her. I had only made a crochet flower once before, so it took a little longer than normal to get it right the first time. The last time I made a crochet flower was when I made the crochet hat which I posted about last month, here is a link to that post. http://www.karimascrafts.com/2011/02/crochet-hat.html Once I knew how to do it again, I made some more, it really was quite easy. I made a large one, which could be used as a hairband or added to a headband. I made smaller ones that I fastened to hairclips. Here is link to a free pattern for a crochet flower, which also has a great short video tutorial to go with it. http://littlebirdiesecrets.blogspot.com/2009/03/how-to-crochet-flower-video-tutorial.html It is well worth a look, it really does show you how easy it is to make a crochet flower. Below is a photograph of the large flower and the small flower hairclip I made. Very Cute! I really wish I knew how to crochet. I may have to try and figure out how to do it. :) Have a wonderful day.